One of the most widely used water measurements, pH is a measure of acidity and alkalinity, or caustic and base, respectively, of a solution. It is expressed typically on a numeric scale of 0-14. A value of 7 represents neutrality. Lower numbers indicate increasing acidity and higher numbers increasing alkalinity. Each unit of change represents a tenfold change in acidity or alkalinity which corresponds to the negative logarithm of the hydrogen-ion concentration or hydrogen-ion activity. pH H+ conc. OH – conc. Why is pH an Important Measurement? How Can pH be Measured? A pH electrode: an electrode whose output voltage changes as the pH (hydrogen ion concentration) changes. A reference electrode: an electrode whose voltage output stays constant. A pH meter: a millivolt meter with a special high impedance input circuit and circuits to change the electrode’s millivolts into pH unit readouts. Optionally, an automatic temperature compensator: a device which senses temperature so that the meter can correct for the effects of temperature changes. 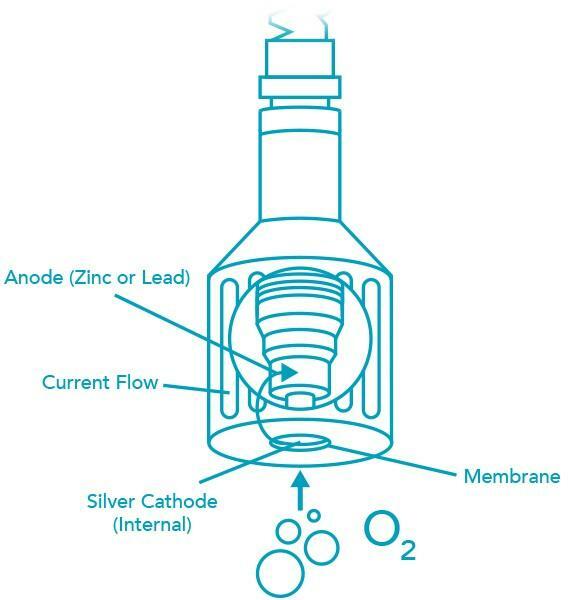 How Does A pH Electrode Work? Special composition glass senses H+ and a millivoltage is generated (59.2 mV per pH unit at 25° C). A filling solution picks up the signal from the special pH glass. A pure silver wire dipped in silver chloride passes the signal from the solution whose pH is being measured to the electrode’s cable or connector. Sodium Ion error for solutions > pH 12.3. 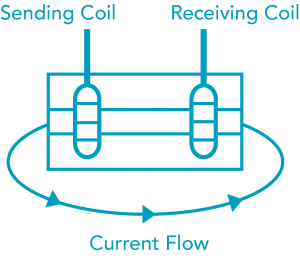 How Does A Reference Electrode Work? A porous reference junction separates the filling solution in the electrode from the solution whose pH is to be measured. The filling solution’s constant chloride ion concentration generates a millivoltage at a pure silver wire with silver chloride on it. The silver wire passes the signal from the solution being measured to the electrode’s cable or connector. Chemicals that cause silver to precipitate at the reference junction will contaminate and plug single junctions. These may be such compounds as sulfides, mercaptans, cyanides, Iodides, and proteins. Other compounds such as silver, lead, mercury, and other heavy metal compounds will react with the chloride in the gel, causing a reduction in the reference output. Selection of the proper chemistry in the lower (double) junction will prevent or at least minimize the negative effects of these reactive compounds. How Does A Combination pH Electrode Work? A combination pH electrode consists of a pH electrode and a reference electrode built into a single body or housing. A combination electrode therefore works like the pH and reference electrodes combined! 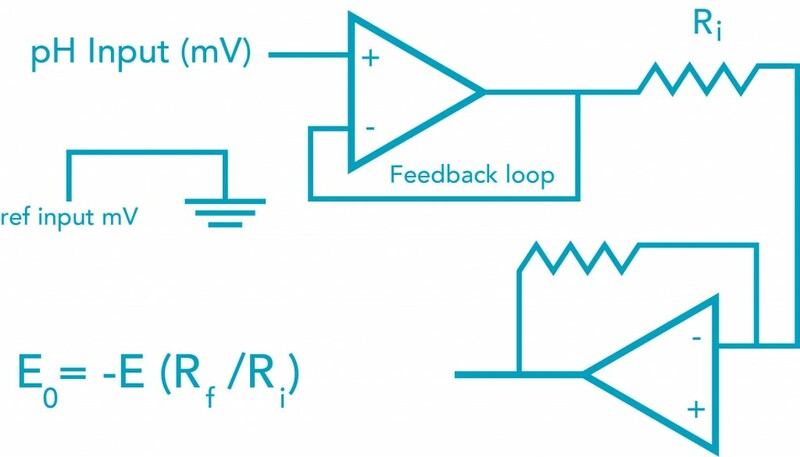 Note that the pH and reference input go into an operational amplifier (op amp) due to the very high resistance of the pH glass. The meter will also adjust zero and span offsets and can do automatic temperature compensation for pH error (discussed below). When measuring pH using a pH electrode the temperature error from the electrode varies based on the Nernst Equation as 0.03pH/10C/unit of pH away from pH7. As shown in the table below, the error due to temperature is a function of both temperature and the pH being measured. Note that there is no error at pH7 and 25° C. Temperature compensation can be achieved manually or automatically. Manual temperature compensation is usually achieved by entering the temperature of the fluid being measured into the instruments menu and then the instrument will display a “Temperature Compensated” pH reading. This means that the pH value is corrected to the value expected at 25° C. Automatic temperature compensation requires input from a temperature sensor and constantly sends a compensated pH signal to the display. Automatic temperature compensation is useful for measuring pH in systems with wide variations in temperature. Note: Values in light blue are less than 0.1 error and may not require temperature compensation. Values in dark blue are temperature and pH in which there is no error in pH from temperature. How are pH Systems Calibrated? The system should read close to the pH value of the second buffer. Most meters have controls labeled “SPAN” or “SLOPE” which compensates for electrodes with spans that are too short. The frequency of calibration is at the discretion of the user. NOTE: Two-point calibration is necessary to ensure electrode works properly since a broken electrode can give acceptable pH7 output in calibration mode. ORP is an abbreviation for for Oxidation Reduction Potential, also know as REDOX, and is a useful measurement for monitoring and controlling chemical reactions. 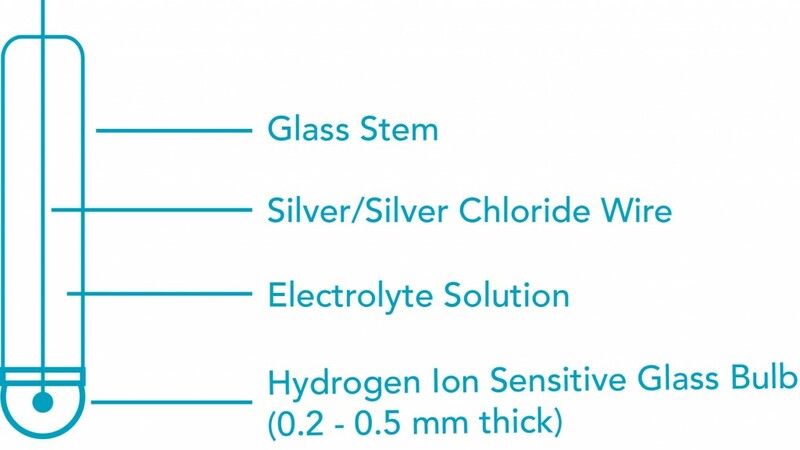 An ORP measuring electrode is identical to pH measuring electrodes except a nobel metal is used in place of the pH glass as the measuring element. Noble metals are used because they will not enter into the chemical reaction taking place. Other nobel metals such as gold or silver can be used but platinum is the most commonly used. The reference is identical to the one used in the pH electrode. It is a Ag/AgCl (silver/silver chloride) wire in 3.5M KCl saturated with AgCl (silver chloride). A second junction for protection of the reference wire is common in industrial electrodes and is referred to as a “Double Junction”. A combination ORP electrode works the same as a combination pH electrode. The measuring electrode generates a millivolt output based on the oxidizing or reducing reactions taking place while the reference electrode generates a constant millivolt output. The working range of an ORP electrode is +/- 2000mV. A pH meter with a millivolt scale or ORP transmitter or controller is used to display readings. Temperature compensation is not used for ORP measurements. The correction factors are system and chemical dependent and are not easily determined. Conductivity is a measurement of the ability of a solution to conduct an electric current. An instrument measures conductivity by placing two plates of conductive material with known area and distance apart in a sample. 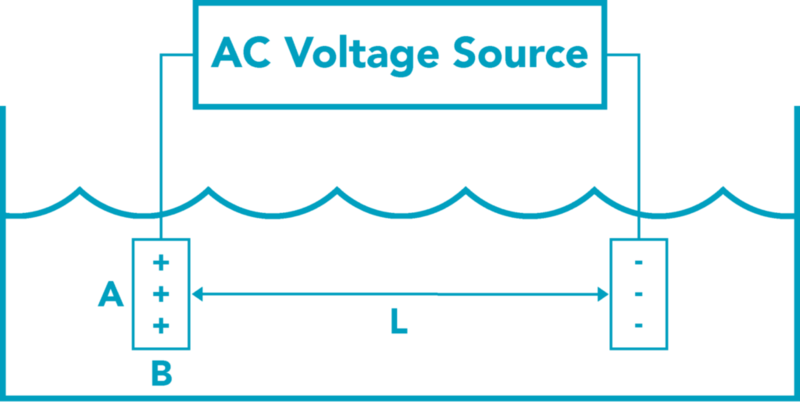 Then a voltage potential is applied and the resulting current is measured. The number of ions that are conductive, metals, salts, etc, provides the conductive path between two electrodes of the conductivity cell. Higher ionic concentration yields higher conductivity. Typically an AC signal is used to prevent ionization of the electrodes. The Terminology used to express a unit of electrical conductance is a microSiemen (Formerly a micromho). High conductivity values can be expressed as milliSiemens. Below 1 microSiemen, we express units of measure as ohms of resistance rather than fractions or decimals of conductance. 1,000,000 ohms = 1 megaohm. 1000 micromhos = 1000 microSiemens = 1 milliSiemen. 1 ppm = 1.5 microSiemen. 1 ppm (sodium chloride) ˜ 2 micro siemens (<30,000 uS). 1ppm (mixed salts) ˜ 1.5 micro siemens (<1,000 uS). Cell constants define the volume between the electrodes. Cell constant k is directly proportional to the distance separating the two conductive plates and inversely proportional to their surface area. K = L/a, where a(area) = A x B. The basic conductivity probe is comprised of two conductive surfaces separated by a given distance in a body. The body material can be anything from PVC, CPVC, PVDF, PTFE, PEEK, or even stainless steel. The measuring surfaces (usually pin configuration) are typically constructed of graphite, stainless steel, titanium, or platinum. The basic criteria for determining which is best are based on cost and performance requirements. Some care should be taken when cleaning conductivity probes. Scratches and abrasions on the surface of the pins increase the surface area which alters the cell constant and provides a retention area for old samples, causing calibration and measurement difficulties. Graphite being a soft material is most susceptible. Cleaning should be done with chemicals and soft non-abrasive cloths. Sanding is not recommended. HCL is an excellent material to dissolve many coatings. The basic two-pin conductivity cell is all we have discussed to this point. There is four-pin technology that tries to better control the field surrounding the conductivity sensor to improve stability. These are known as contacting type conductivity cells. Evaporation control – dried milk, etc. 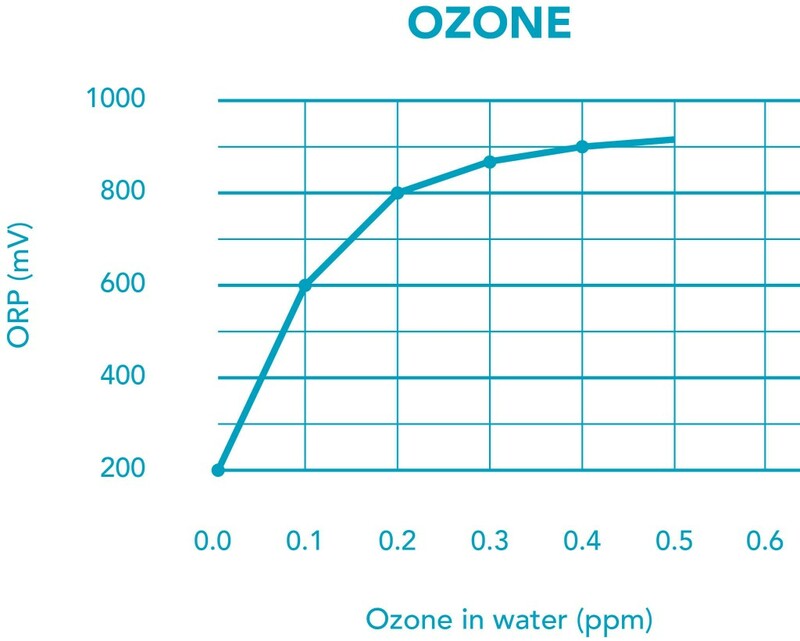 Dissolved Oxygen (DO) is the term used for the measurement of the amount of oxygen dissolved in a unit volume of water. In water quality applications, such as aquaculture (including fish farming) and waste water treatment, the level of DO must be kept high. For aquaculture if the DO level falls too low the fish will suffocate. In sewage treatment, bacteria decompose the solids. If the DO level is too low, the bacteria will die and decomposition ceases; if the DO level is too high, energy is wasted in the aeration of the water. With industrial applications including boilers, the make-up water must have low DO levels to prevent corrosion and boiler scale build-up which inhibits heat transfer. Although dissolved oxygen (DO) is usually displayed as mg/L or ppm, DO sensors do not measure the actual amount of oxygen in water, but instead measure partial pressure of oxygen in water. Oxygen pressure is dependent on both salinity and temperature. There are two fundamental techniques for measuring DO— galvanic and polarographic. Both probes use an electrode system where the DO reacts with the cathode to produce a current. If the electrode materials are selected so that the difference in potential is -0.5 volts or greater between the cathode and anode, an external potential is not required and the system is called galvanic. If an external voltage is applied, the system is called polarographic. Galvanic probes are more stable and more accurate at low dissolved oxygen levels than polarographic probes. 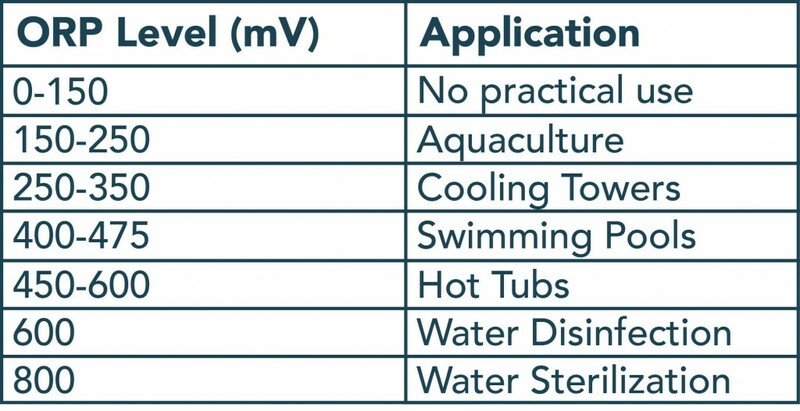 Galvanic probes often operate several months without electrolyte or membrane replacement, resulting in lower maintenance cost. Polarographic probes need to be recharged every several weeks of heavy use. Galvanic DO sensors consist of two electrodes: an anode and cathode which are both immersed in electrolyte (inside the sensor body). An oxygen permeable membrane separates the anode and cathode from the water being measured. Oxygen diffuses across the membrane. It interacts with the probe internals to produce an electrical current (more detail is shown below the DO sensor graphic). Higher pressure allows more oxygen to diffuse across the membrane and more current to be produced. The actual output from the sensor is in millivolts. This is achieved by passing the current across a thermistor (a resistor that changes output with temperature). The thermistor corrects for membrane permeability errors due to temperature change. In other words, increasing permeability at higher temperature allows more oxygen to diffuse into the sensor, even though the oxygen pressure has not changed. This would give falsely high DO if the thermistor were not used. To represent sensor output in ppm or mg/L, the temperature of the water must be known. A separate temperature sensor can be used or one can be built into the sensor. This is independent from the thermistor connected between the anode and cathode to compensate for membrane permeability changes due to temperature change. The pH of the solution does not affect the performance of membrane probes. Chlorine and hydrogen sulfide (H2S) cause erroneous readings in DO probes. Atmospheric pressure (altitude above sea level) affects the saturation of oxygen. DO probes must be calibrated for the barometric pressure when reading in mg/l (ppm). Membrane thickness determines the output level of the probe and the speed of response to change in DO levels. 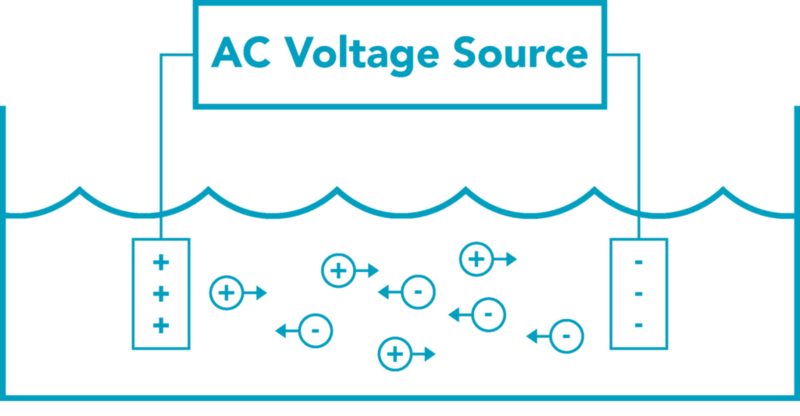 The anode reacts with the product of the depolarization with a corresponding release of electrons. The electrode pair permits current to flow in direct proportion to the amount of oxygen entering the system. The magnitude of the current gives us a direct measure of the amount of oxygen entering the probe. Because all of the oxygen entering the probe is chemically consumed, the partial pressure of oxygen in the electrolyte is zero. Therefore, a partial pressure gradient exists across the membrane and the rate of oxygen entering the probe is a function of the partial pressure of oxygen in the air or water being measured. Since the partial pressure of dissolved oxygen is a function of temperature of the sample, the probe must be calibrated at the sample temperature or the probe’s meter must automatically compensate for varying sample temperature. Note that this thermal effect is different from the thermal response of the membrane discussed above. The reading of a DO probe must be corrected for the amount of salt in the sample. As seen in the chart below, the salt in solution will reduce the actual concentration of oxygen. In all DO Probes, the membrane/sample interface should have a few cm/sec flow of the sample for precision performance. Without flow at the interface, the surrounding oxygen will be consumed and the local reading dropped. The output of the probe increases (up to a point) with relative movement between the probe and sample. If different gases are mixed in a confined space of constant volume and at a definite temperature, each gas exerts the same pressure as if it alone occupied the space. The pressure of the mixture as a whole is the total of the individual or partial pressure of the gases composing the mixture—Dalton’s law of partial pressures. The partial pressure of each gas is proportional to the number of molecules of that gas in the mixture. Air is 20.948% oxygen. When air bubbled through water, only 20% as much oxygen dissolves as would dissolve if pure oxygen were used instead of air, at the same pressure. Concentration of dissolved oxygen is also measured in units of % saturation. “% saturation” is simply the ratio of the measured mg/L of dissolved oxygen divided by the mg/L of dissolved oxygen at saturation—as given in the above tables, saturation levels is dependent upon the temperature, salinity, and pressure. Since % saturation is a ratio, it is not affected by these conditions if the calibration at 100% saturation was performed under the same conditions. Increasing temperature usually increases the solubility of solids and liquids whereas it reduces the solubility of gases. Also keep your units straight–mg/L, ppm, ml/L, % saturation.